Beer lovers rejoice! [Mats] has reverse engineered a temperature controller and written new open source firmware for it. This effectively gives all us homebrewers a low cost, open source software driven controller. The STC-1000 is a cheap (under $20 USD) temperature controller mass-produced in the far east. The controllers do work, but have several limitations. The programming options are somewhat limited to basic set points for heat and cool. The controller also is only programmed for temperature display in Celsius, which is a bit of an annoyance for those of us who think in Fahrenheit. Under the hood, the STC-1000 utilizes a Microchip PIC16F1828 microcontroller. Unfortunately the PIC’s protection bits were set, so the original code would have been extremely difficult to extract. Not a problem, as [Mats] reverse engineered the hardware and wrote his own firmware. A 10k NTC thermister acts as the temperature probe. The probe is read by the PIC’s ADC. These probes are not very linear, so a look up table is used to convert from volts to degrees Celsius or Fahrenheit. [Mats] new firmware allows for up to 6 profiles. Each profile has up to 10 set points and a time duration to hold each of the set points. Hysteresis and temperature offset values are also programmable via the front panel. PIC software is often written in C using Microchip’s MPLAB tool chain, and programmed with the PICkit 3 In Circuit Serial Programming (ICSP) tool. [Mats] decided to buck the system and wrote his C code using Small Device C Compiler. To keep things simple for homebrewers who may not have Microchip tools, [Mats] used an Arduino Uno for flashing duties. Thankfully the unholy matrimony of a PIC and an AVR has not yet caused a rift in time and space. The firmware is still very much in the beta stage, so if you want to help out, join the discussion on the homebrew talk forum. If you see [Mats] tell him we owe him a Haduino which he can use to almost open his beer. It is mid-day Saturday and the Midwest RepRap Festival is in full swing. Saying that there is a lot of 3D printers here is an extreme understatement. There must be at least 100. Out of all these, there are a couple that stand out from the rest due to their non-standard geometry. These are both creations of [Nicholas Seward], called the Wally and Simpson. Both of these printers were designed to not use linear rails or bearings and be as reprap-able as possible. For example, the Simpson’s only non-printed custom parts are the two wooden base plates and the print bed. The rest of the parts are general hardware and standard 3D printer electronics. [Nicholas] is showing off something new this weekend (less than 2 weeks new, actually). It is a new printer, currently code named CoreXZ. Unlike his previous designs, the CoreXZ does use linear rails and bearings. The frame is laser cut and is held together with zip ties. This new design uses an h-bot style setup for movements in the X and Z axes. The Y axis is a standard moving bed design with linear rails and bearings. Remember the days when the future was console cowboys running around cyberspace trying to fry each other’s brains out? MIT Media Lab remembers too. They have a class called MAS S65: Science Fiction to Science Fabrication in which students are trying to create hardware inspired by technology imagined in the works of legendary Speculative Fiction writers such as William Gibson, Neal Stephenson and many others. They happened to be at SXSW this year showing off some of the projects their students have been working on. Since we were around, we thought we should pay them a little visit. Fifteen minutes later it was clear why working at Media Lab is a dream for so many hackers/makers out there. 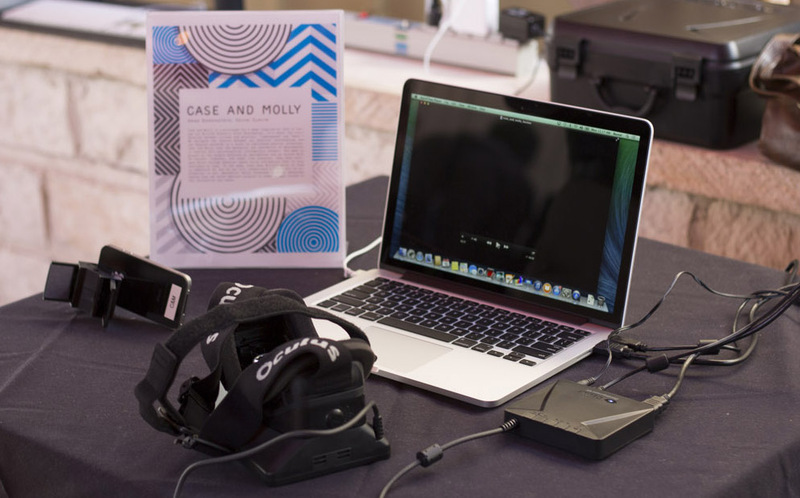 Jon Ferguson from Media Lab showed us a prototype of a game called Case and Molly, inspired by scenes in Neuromancer in which Case helps Molly navigate, by observing the world through vision-enhancing lenses sealed in her eye sockets. 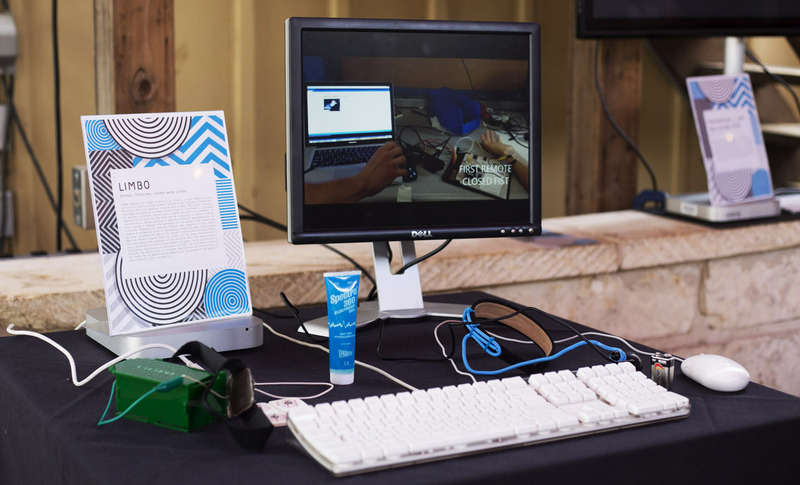 OK, they haven’t really build surgically-attached internet-connected lenses (yet.. we’re certain[Ben Krasnow] is working on it), but they have built a very cool snap-on 3D vision mechanism that attaches to the built-in iPhone camera. Add a little bit of live video streaming, a person with Oculus Rift and a game controller and you can party like it’s 1984. 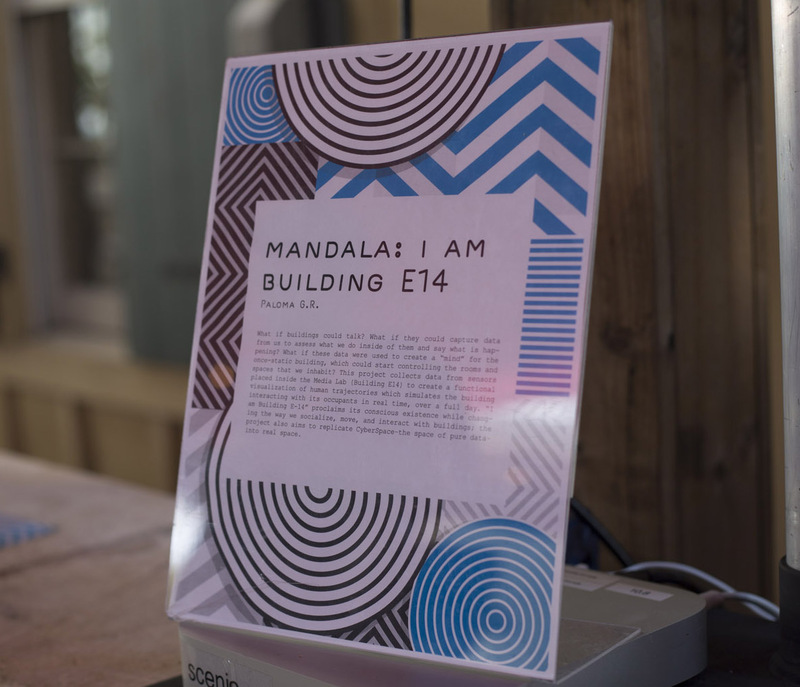 Another interesting project is called “Mandala : I am building E14” and it uses data collected from a sensor network in MIT E14 in order to provide a view of the universe from the standpoint of a single building. It tries to address the old “what if buildings could talk?” question by visualizing the paths of people walking around the building and providing an overall sense of activity in different areas. It is also a pretty good demonstration of all the creepy things that are yet to be built using all the ‘connected devices’ coming our way. It gets better. The Sensory Fiction project is a special book that comes with a vest which enhances the reader’s experience by providing stimulation that causes the reader to experience the same kind of physiological emotions as the characters in the book. The wearable that you have to put on supports a whole bunch of outputs: light, sound, temperature, pressure and vibration that can influence your heart rate. It is very easy to imagine so many potential ‘creative’ abuses of such a device. Another Neuromancer-inspired piece, called LIMBO (Limbs In Motion By Others) allows synchronization of hand gestures between multiple ‘users’ over a network using a special electric muscle stimulation rig. The result is a sort of ‘meat puppet’ – one person’s hand being forced to match movement of the other. Devious ideas aside, it has great potential in helping paraplegic control their muscle movement using eye tracking. Finally, a more cheerful project called BubbleSynth demonstrates an open computer vision/sound synthesis platform using physical processes as input to granular synthesis. 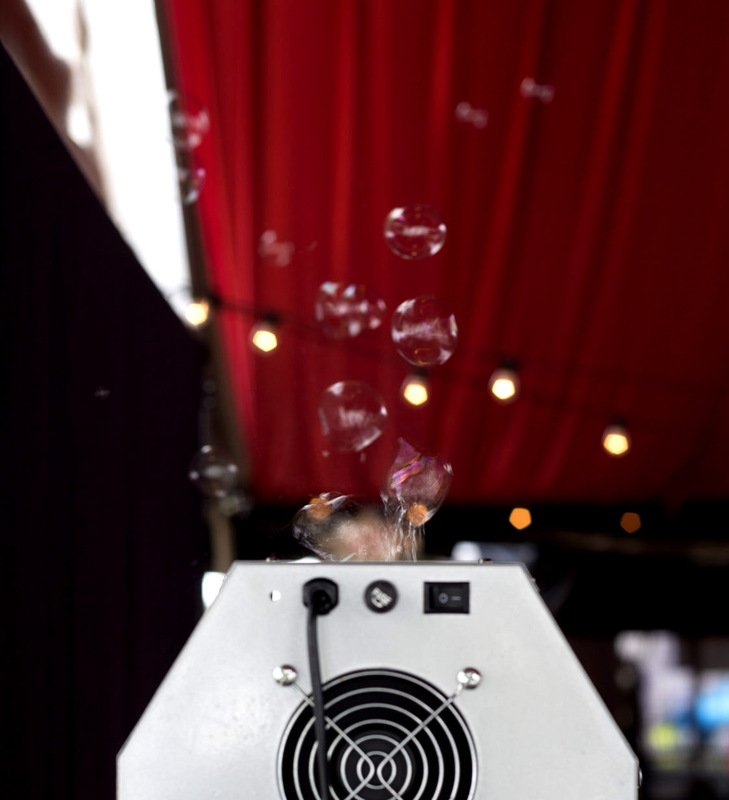 The current installation is based on a bubble generating machine and motion tracking as a trigger for a modular synthesizer resulting in beautiful ambient sounds. The audio part of the platform is based on SuperCollider and is completely customizable. The next iteration of the project will be using movement of a species of bacteria in order to generate the music. Why struggle learning how to play an instrument? We’ll get bacteria do all the work. Feel like building something similar? 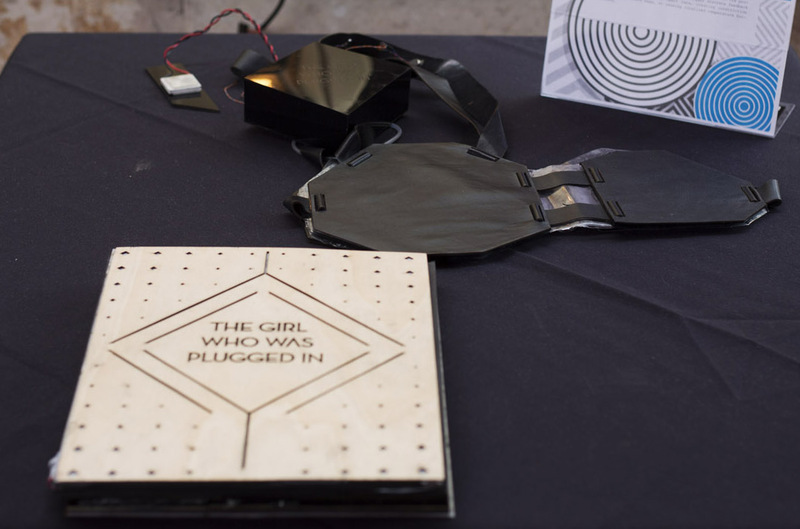 Hackaday’s current Sci-Fi contest is a perfect excuse. Need inspiration? Check out the syllabus for the MIT SciFi2SciFab class!